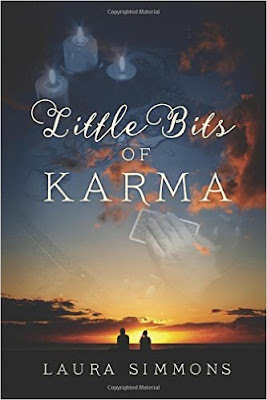 I received this book for free from the author, Laura Simmons. This book was sent to me through Bostick Communications. Laura Simmons sent me a copy of this book in exchange for an honest review. Synopsis: Even though Holly O'Rourke is having problems with her long time significant other, James, she has never entertained thoughts of infidelity, that is until one day she has a chance encounter with Charlie, a handsome co-worker. James promises he will change and work on their relationship but Holly's feelings for Charlie just won't go away. Distressed by her mixed emotions, Holly schedules an appointment for a reading with a psychic medium, where she discovers her adulterous past lives and their tragic consequences. Holly learns to do her own past life regression through self-hypnosis and uncovers not only lives that she shared with James and Charlie, but how the other people in her present life have been with her in the past - the threads of their lives interwoven for centuries. Holly is stunned by recurring themes and the issues of karmic justice that need to be addressed. Where will her karmic path ultimately lead? Review: I would like to thank the other for sending me this book. I accepted this book to review as I wanted to try something outside of my usual genre's. Normally, I stick to fantasy, crime and horror novels so a romance book was a big change for me. I found that I simply did not enjoy reading this book, that does not mean that it is not a good book to read, as I just found it hard to enjoy something in the romance genre. My sister also read and reviewed this book but she really enjoyed it as romance is more her genre of book than it is mine. The enjoyment of this book depends on the reader and what they enjoy in a book, if you are not normally a fan of romance then I wouldn't recommend this book but if you are into romance novels then this is definitely the book for you to pick up and read. Even though I wasn't head over heels in love with this book I did manage to read it to the end and was pleased to have stuck with it and not gave up just because it was a genre which was not my favourite. *The only reason I gave this book such a low rating is because I do not enjoy romance novels. If I decide to reread this in the future then I will update my review letting you know if I felt the same about the book or whether I liked it more or less than the first time I read it. I will be honest and say that I am not likely to reread this book as I am sure that even in the future I will still be into the same book genres as I am now.